If your thing in music is electronic beats composed on a computer and laid beneath references to Diddy and Prada in songs that pander to the 20-something club-going set, then by all means, imbibe to your little heart’s content I guess. But for the rest of us, we want music that speaks to who we are, that sounds like where we’re from, that is formed and pressed by human hands, brought to life by wood and wires, bred to fit our sensibilities, our frailties and joys and experiences. We want music about adults, for adults, and by adults, in tones and modes that don’t feel like an insult to us, and uplift through story, fulfill through character, and feel like they’re composed right from the pages of our own little lives that may be insignificant and non-glamourous to the hip club goers or in the grand scheme, but they’re ours dammit, and we’re living them, and they mean something to us that will never be supplanted by someone else’s ideal. Deep, enriched storytelling is a family business for Courtney Patton. She may be Jason Eady’s wife, but it’s just as apt to say Jason Eady is Courtney Patton’s husband. Truth is this “First Songwriting Couple of Texas Country” are like two sides of the same coin since both take the business of songcraft so seriously, both help to enhance each other’s output, yet they both challenge each other to up their game, turn in a better, more touching or insightful turn of phrase, until there’s no loser aside from the bad music that’s left aside as listeners in-the-know soak up the authentic country spirit wrought in Courtney Patton’s songs. Isn’t that so true about so many things, including the great artists laboring to be seen without the benefit of big spotlights, but are often more brilliant than the big stars, even when cast among the shadows of dimly-lit songwriting bars, or the corner stages of dusty honky tonks. 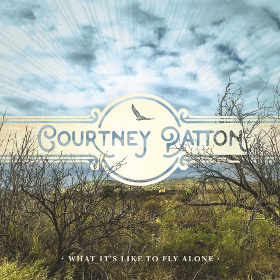 The above lyric is just one of the nuggets of wisdom to emerge from Courtney Patton’s latest album What It’s Like to Fly Alone, and comes specifically from the opening song “Shove” about having the humility to ask for assistance sometimes, even when pride wants to get in the way. Courtney Patton needs no assistance from anyone in the songwriting department, but she does enlist the services of the legendary Lloyd Maines on pedal steel and guitar, long-time Gene Watson piano player Chip Bricker, along with Giovanni Carnuccio and Jerry Abrams from Jason Eady’s band to help bring the songs of What It’s Like to Fly Alone to life. 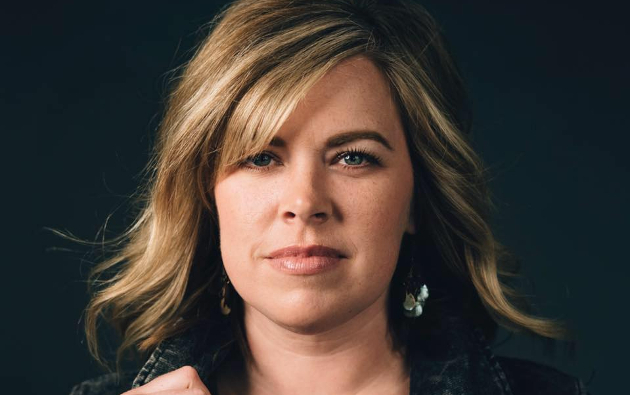 Jamie Lin Wilson and Dan Tyminski also offer harmony vocals on the effort, and Larry Hopper, Mickey Braun, Owen Temple, and Matt Hillyer of 1100 Springs show up in the songwriting credits, though most of the heavy lifting is handled by Patton herself. The album might hit its high point in the title track, which evokes such brilliant imagery, it’s hard to let go of. This record is about perseverance, overcoming adversity, lifting yourself up, and making the best of your circumstances, even if it gets a bit hairy here and there, like how sometimes heartbreak can lead to relief and freedom embodied in the story of “I’ve Got One Waiting,” brought to life in all of its misery and joy by the moan of Lloyd Maines’ steel guitar. Similar to what has been said here about some of Jason Eady’s music, What It’s Like to Fly Alone could possibly use a bit more gas behind it at times, or perhaps some additional texturing to broaden the appeal of the music. That said, a Courtney Patton record is an exercise in self-discipline and austerity to not get drawn too outside of who she is, or what she wants to impart, which are stories of people who feel real in the mind, with musical accompaniment well within country music’s borders. Most any catchy beat or hum-able tune can impart some sort of spark to the spirit, but it’s a select few songs that can make you soar, especially when there’s nobody else around but yourself to rely on. It’s you, and music. Courtney Patton captures quite a few of those soaring moments in What It’s Like to Fly Alone. This one is an early front runner for album of the year. After a dozen spins the album keeps getting better. Agree 100%. Love this album. I listened to all the clips for this album as I was not familiar with Courtney until reading about her on SCM. Sounds really good and will pick this up, having Lloyd Maines on steel is a real bonus. Although I live a couple of states over from Texas, some of the Texas-based country artists don’t always tour our way, so there’s a delay in hearing about them, so thanks to SCM for bringing them to our attention. I’d appreciate recommendations from other SCM readers here more familiar with Courtney and Jason as to where one should start with their previous records. Biscuit, check out So This Is Life, her previous album…it’s amazing! I like her voice… a lot! Thanks for your continuing work of bring unfamiliar artist to our attention. This coming out right after Wade Bowen’s new album,looks like things are looking up in 2018! Pretty good write up, but the 7.5 is a joke. The very recently reviewed, questionable on many fronts Brandi Carlile new album gets an 8? Come on. This Patton album is so well done, down to its amazing production / sound quality (Courtney produced it herself). Everyone needs to go out and buy this, not only for the fact that it’s a stellar album, but because it’s done in such a cool way by a great person. I’ve been enjoying the stellar sounding (no annoying Carlile reverb on this one!!!) vinyl the past few weeks. It came hand addressed by Courtney, shipped straight from TX. Absolutely agree that this album is superior to the new Carlile album. Agreed! Halfway through the first song on this one I knew it was going to be a great album. It’s easily a front runner for album of the year. As for the Brandi Carlile album, I really don’t get the hype around it. It’s fine, but, other than the first song, I don’t see myself going back to it for multiple listens. I agree 100% about the production. This is some of the best, most clean production I’ve heard in recent memory. Have to say I did enjoy the Carlile album as well, but I do think this one is better. I’d give it a little more love than this, but thanks for reviewing. Seeing her in a number of different sets at Mile 0 was a highlight for us. Great voice! I’ve been a casual Jason Eady fan since he put out AM Country Heaven a few years ago, but never got around to checking out Courtney even though she’s mentioned almost every time Trigger brings up Eady. I’ve gotta say, “Shove” is a great tune, and a lot catchier than some of Eady’s recent songs. Thanks for letting us know about this release. As someone stated above, this may be an early contender for Album of the Year. I’ve been listening on repeat for a few hours this morning! I flipping love this new album from Courtney Patton. This album has an ability to touch on a lot of universal truths/experiences for women, which I found impressive because Courtney has stated that this is her least personal album- she would take stories or lines she heard and craft a song around them. To bring this level of craft to a story not your own is what elevates a songwriter, in my opinion. There are some personal songs on here, such as the title track and “Fourteen Years.” This is definitely my early frontrunner for album of the year. Very Kim Richey……and that’s a GOOD thing, in my opinion . Lots of potential in her vocals….but ..
I’d like to hear Courtney challenge herself a bit more in that department . This song , for instance seems to be in a key that doesn’t force her to tap into that all-important vocal emotion . The register is just too low and consequently the melody , even with the help of the low harmony , lacks dynamic . So yeah ….my thoughts are mostly production/arrangement related but even a fairly pedestrian lyric like Dolly’s ” I Will Always Love You ” became an almost religious experience when Whitney Houston sang it and the production included a modulation which put Whitney’s pipes and our emotional reactions into the stratosphere . No …I’m not suggesting Courtney is Whitney or should try to be……just illustrating ( rather dramatically , perhaps ) how important the RIGHT key is to a song’s ability to connect emotionally- Stand By Your Man , How Do I Live ( Rimes/Yearwood written by Dianne Warren ). Sometimes a vocalist forgets to use that tool . Really like the tune and the musical vibe ….I just think its better in a higher key . Good call on Kim Richey. You’re probably right about key and delivery, but that’s where good producers can make a big difference. On the other side, there are plenty of emotional, dynamic singers who try to make their delivery carry a trite and trivial lyric. I don’t think “I will always love you” is the best example of that. Dolly wrote it for Porter, and those words convey a whole lot more than “I’m a 90’s baby, in an 80’s Mercedes.” Don’t you think? Yeah, this is really good stuff. If the 7.5 is in comparison to recent grades of others I’d say it’s too low. If the 7.5 is in comparison to what she’s capable of I get it (i.e. – a Courtney Patton 7.5 is like a 9 for most other songwriters). Think I might have to check this one out, go down to the local record store sometime this week. Don’t think these reviews go unnoticed, Trig. SCM.com… I came for the sexism and misogyny, but stayed for the overwhelming abundance of grounded and confident female artists that have, like, you know… actual musical talent. Anyone find this album on Spotify yet? Seems late for all of the reviews coming in. She did the Spotify delay with her last album as well. I understand the theory, but in this day and age, you’re really limiting your audience with this approach.